At Waukesha® Metal Products we’re especially proud of our in-house tool and die shop. Not every metal stamping and fabrication shop can build their own tools, so this capability provides our customers with many unique advantages. Combined with our experienced team of journeyman toolmakers, this equipment helps improve Waukesha Metal’s efficiency and lowers production costs. 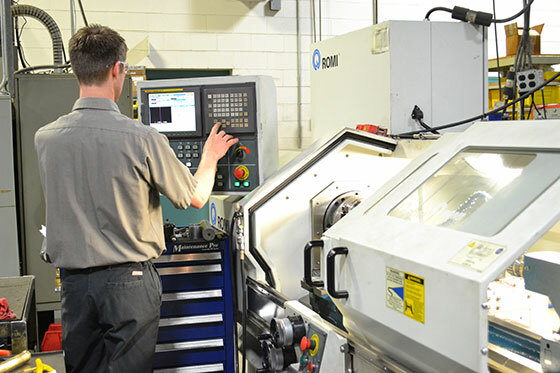 Our tool and die room is equipped with a wide range of CNC machining centers, CNC lathes, wire EDMs, grinders, a heat treating furnace, and mills. This diverse set of equipment allows us to build the right die for the job, no matter how complex. We’re especially proud of the capability that this equipment gives us to make innovations with our servo press technology. The equipment is also perfect for progressive tool and die work. Below you can find a complete list of our tool and die shop equipment. design stage all the way to parts off the press. Our tool room allows us to work closely with our customers’ engineers to provide tailor-made solutions for their designs. If you need a unique die or have custom tool design needs, our engineers can make them a reality. Once production starts, you can be sure that our tool and die team is keeping an eye on your project. Should an issue occur, the fact that they’re in-house means that they can minimize downtime and get production back on track quickly. The Waukesha® Metal Products tool and die room also helps implement our custom sensor technology, preventing damage, minimizing waste, and decreasing lead time.